The PGA Tour’s 2014–2015 season will include seven events hosted on Nicklaus Design courses in the United States, Canada, and South Korea. Since 1970, no fewer than 110 Nicklaus Design layouts have hosted a combined total of over 770 professional golf tournaments or significant national amateur championships worldwide including events on the PGA Tour, the Champions Tour, the LPGA Tour and the Web.com Tour, among others. The Nicklaus Design courses playing host to PGA Tour events in 2014–15 include: Nicklaus Private Course at PGA West (Humana Challenge); the Champion Course at PGA National (The Honda Classic); Harbour Town Golf Links (RBC Heritage); Muirfield Village Golf Club (the Memorial Tournament presented by Nationwide Insurance); Glen Abbey Golf Club (RBC Canadian Open); Montreux Golf and Country Club (Barracuda Championship); and the Jack Nicklaus Golf Club Korea (The Presidents Cup). “After the successful debut of our wraparound schedule this season, we have another very strong schedule for 2014–2015 that will provide excitement for our fans and additional playing opportunities for our members,” said PGA Tour Commissioner Tim Finchem. Here’s a look at each of the upcoming Nicklaus Design host courses and tournaments. Humana Challenge in partnership with the Clinton Foundation — PGA West (Palmer Private Course, Nicklaus Private Course); La Quinta, California: The Humana Challenge will be contested on PGA West’s Nicklaus Private Course at La Quinta Resort & Club from January 19–25, 2015. There will be Pro-Am play for the first 54 holes. Each of the 156 pros will play with a different amateur partner each day on different courses for three days. On Sunday, the low 70 professionals and ties will play the final round of the tournament, along with the top three low net and low gross amateurs. The overall low net amateur and low gross amateur playing on Sunday will be named the 2014 Humana Challenge Amateur Champion. The defending professional champion is Patrick Reed. The Jack Nicklaus Private Course at PGA West opened for play in 1987 and became the third course at PGA West to host the Humana Challenge. It has been a part of the tournament’s history since 2009. Also a Certified Audubon International Cooperative Sanctuary, the Jack Nicklaus Private Course at PGA West has the highest rating (74.3) and slope (146) of the three Private Courses at PGA West. La Quinta Resort & Club has frequently been ranked in Golf Digest’s list of the 75 Best Golf Resorts in the U.S. Initially, Nicklaus was commissioned to design the course to host the 1991 Ryder Cup. With international television coverage gaining prominence, the event was moved to the east coast to Kiawah Island’s Ocean Course. The Honda Classic — PGA National (Champion Course), Palm Beach Gardens, Florida: The Honda Classic, played in Palm Beach Gardens, Fla., near the Nicklaus family’s North Palm Beach home, will be held February 23–March 1 at PGA National’s Champion Course. Russell Henley is the current defending champion. In addition to being hosted on the Jack Nicklaus-redesigned golf course and in such close proximity to the Nicklaus Companies’ world headquarters, the event is further connected to the Nicklaus family through its mission of giving back to the children of the local community. Proceeds from the event support Children’s Healthcare Charity, which has as its primary beneficiary the Nicklaus Children’s Health Care Foundation. The Honda Classic awarded a record $2.55 million in charitable contributions in 2014, exceeding the previous record of $2.13 million, which was given to a wide roster of local causes last year. It was the eighth straight year the event has increased its charitable distribution to South Florida Children’s Charities. The Champion Course at PGA National has hosted The Honda Classic annually since 2007, and previously hosted the PGA Cup Matches in 1994 and the Senior PGA Championship from 1982 through 2000. Golf Digest named the “Champ” the Toughest Course (Non-Major Division) on the 2013 PGA Tour schedule. According to the magazine, the three-hole stretch of Nos. 15-16-17—affectionately and appropriately known as The Bear Trap—was a big reason why the course played to an average of 1.318 over par. In recent months, the par-4 14th hole was renovated and redesigned, adding teeth to the layout as players work toward The Bear Trap. This year, the Champion Course was named to Golfweek’s lists of the Top 100 Resort Golf Courses and the Best State-by-State Courses You Can Play. The course was also named to Golf Magazine’s 2014 list of 30 Best Courses Near You. Coming up in December 2015, the course will host the Web.com Tour’s qualifying finals. RBC Heritage — Harbour Town Golf Links, Hilton Head Island, South Carolina: The 47th RBC Heritage will take place April 13–19, 2015, at Harbour Town Golf Links on Hilton Head Island in South Carolina. A design collaboration between Jack Nicklaus and Pete Dye, Harbour Town Golf Links has the distinction of being the first golf course to involve the design work of the Golden Bear. Similarly, the course is also the first of more than 110 Nicklaus Design golf courses to host a PGA Tour event, with Harbour Town debuting as a tournament venue Thanksgiving weekend in 1969. Nicklaus won the RBC Heritage in 1975, shooting rounds of 66-63-74-68. The event’s defending champion is 2013 Memorial Tournament winner Matt Kuchar. Harbour Town Golf Links is recognized as one of America’s top courses, and is repeatedly selected by the PGA Tour professionals as one of their favorites. It was named one of the top 20 courses in the country by Golf Digest and Golf Advisor, named No. 14 among America’s 100 Greatest Courses You Can Play by Golf Digest, and named No. 39 in Best 75 Golf Resorts in North America. The Sea Pines Resort occupies 5,000 acres on the southernmost tip of Hilton Head Island. It offers accommodations, recreation, and sports amenities unequaled by any other PGA Tour stop in the country. The Memorial Tournament presented by Nationwide Insurance — Muirfield Village Golf Club, Dublin, Ohio: The Memorial Tournament presented by Nationwide Insurance will be held June 1–7 outside of Jack Nicklaus’ hometown of Columbus, Ohio. Founded and hosted by the Golden Bear, Nicklaus is himself a two-time winner of the event (1977, 1984). Lauded as one of the best stops on the PGA Tour, the event annually attracts one of the best fields in golf. Hideki Matsuyama, a 22-year-old from Japan, recorded his first PGA Tour victory at the 2014 event, defeating Kevin Na in a thrilling playoff. “To win my first PGA Tour event is enough, but to win it here at Mr. Nicklaus’ course, it really gives me a lot of confidence now going on,” Matsuyama said. Year after year, fans can count on the strength of the field bringing drama to the tournament course, but the setting itself is just as exciting for spectators as the golf. The course has appeared on Golf Digest’s lists of the World’s 100 Greatest Golf Courses, America’s 100 Greatest Golf Courses, America’s Most Important Golf Courses by Decade, America’s 75 Toughest Golf Courses, and the Best Golf Courses in Each State. Both Golfweek and Golf Course Architecture named Muirfield Village to their lists of the Best Modern Courses, and Golf Course Architecture also named the course to its Architect’s Choice Top 100 Golf Courses list. With the Memorial Tournament celebrating its 40th playing in 2014, Nicklaus reflected on its beginnings. RBC Canadian Open — Glen Abbey Golf Club, Oakville, Ontario, Canada: The RBC Canadian Open will take place July 20–26, 2015, in Oakville, Ontario, marking the PGA Tour’s only stop through Canada. Renowned as the longtime home of the Canadian Open, Glen Abbey will play host to Canada’s National Open Championship for a record 27th time. ‘The Abbey’ hosted 22 Canadian Opens between 1977 and 2000 as well as 2004, 2008, 2009 and 2013. The tournament was last held at Jack Nicklaus’ first solo design in 2013—an event won by PGA Tour star and Team RBC member Brandt Snedeker. That same year, it was named to Golf Digest’s list of the Best Canadian Modern Golf Courses—a distinction conferred again to the course in 2014. Barracuda Championship — Montreux Golf and Country Club, Reno, Nevada: The 2015 Barracuda Championship will be played August 3–9, 2015, at Montreux Golf and Country Club in Reno, Nevada. The well-known Tour stop is the only tournament on the PGA Tour to use the Modified Stableford scoring system, awarding positive points for birdie or better (8 for double eagle, 5 for eagle, 2 for birdie) and subtracting points for bogey (minus-1) or worse (minus-3). The tournament signed a four-year title sponsorship with Barracuda in July 2014, just before the 16th playing of the event. In its 17th year, the Barracuda Championship will incorporate a unique charity element on the reachable, downhill par-5 18th hole. The Barracuda Bonus will be a competition within the competition, with players accumulating points on No. 18 throughout the week. The player with the most points on the closing hole will receive a bonus to donate to the charity of his choice. Moreover, an additional charity bonus will be awarded to any player who makes double-eagle 2 on the hole. There has been one double-eagle made on the hole since the tournament’s inception in 1999. Montreux Golf & Country Club was designed by Jack Nicklaus and opened for play in 1997. In 1998, Golf Digest named the course No. 3 on its “Best New Private Courses” list, and in 2014, the course was named to Golfweek’s Best Residential Courses. 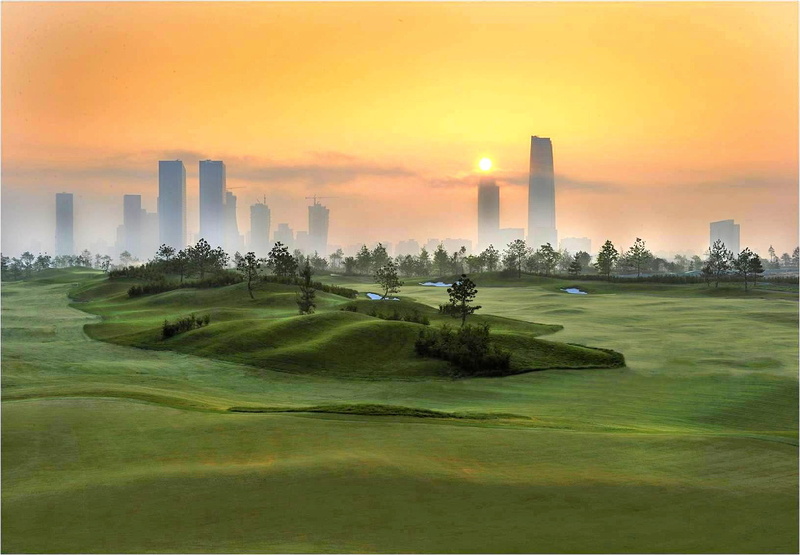 The Presidents Cup — Jack Nicklaus Golf Club Korea, New Songdo City, South Korea: The 2014–2015 PGA Tour season will culminate in The Presidents Cup, hosted at Jack Nicklaus Golf Club Korea, when the international team competition is played for the first time in Asia. Jack Nicklaus Golf Club Korea is the second Jack Nicklaus-designed course to host The Presidents Cup in two years, with the 2013 Presidents Cup being held at Muirfield Village Golf Club, before record-setting crowds in Dublin, Ohio. Jack Nicklaus Golf Club Korea will be the fourth international venue to host The Presidents Cup, joining The Royal Melbourne Golf Club in Melbourne, Victoria, Australia (1998, 2011); The Links at Fancourt, George, South Africa (2003); and The Royal Montreal Golf Club in Montreal, Quebec, Canada (2007).